Are you looking for a crowd pleasing easy football recipe for the upcoming big game day? 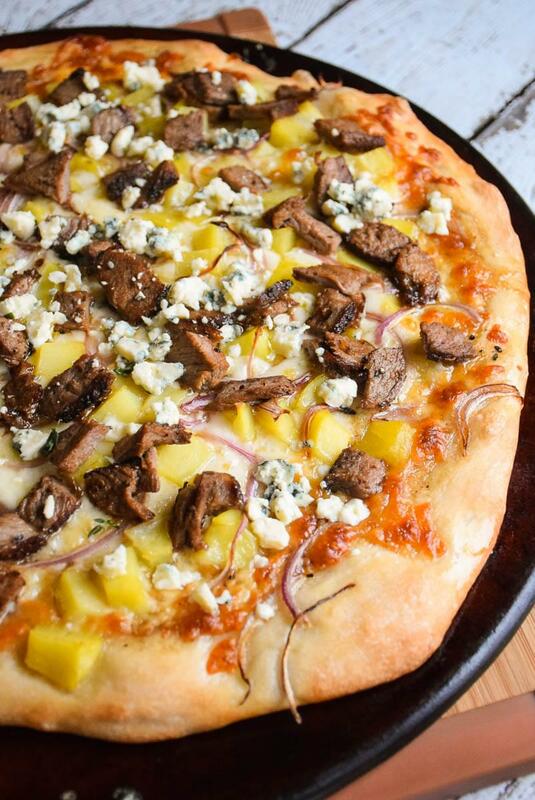 If so, this Steak and Potato Pizza is going to fit the bill and meet your expectations! 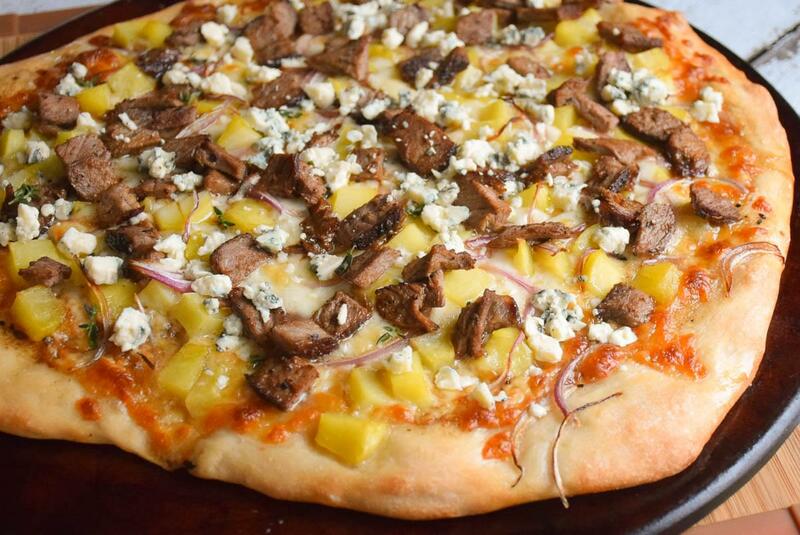 This pizza is chock full of lean steak, golden potatoes cubes and cheese! Pure good and hearty finger food for all those happy gamers! 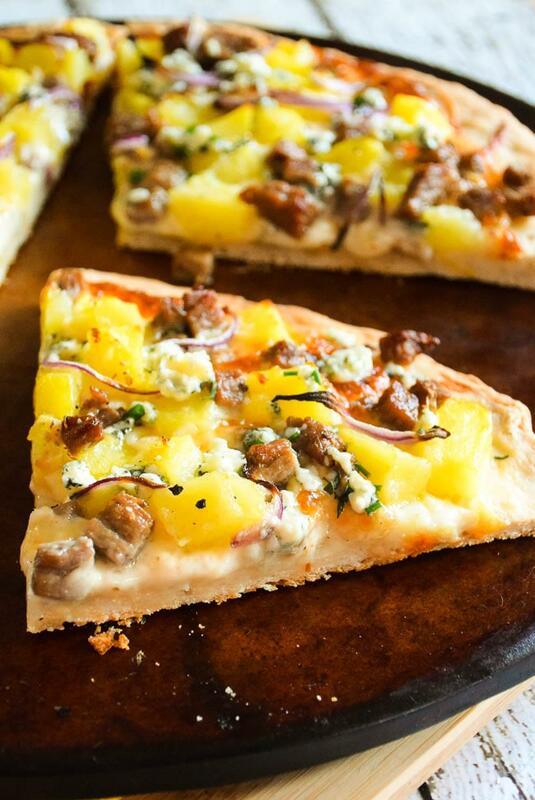 If you love a dinner filled with lean flavorful steak and potatoes, then this pizza is going to be for you! Made with golden Idaho® potatoes, complimented with cheese both mild and bold, garlic flavored steak bites, and red onion slices, it’s almost like having a steakhouse dinner except your plate is the pizza crust! Grumpy absolutely loved this pizza! 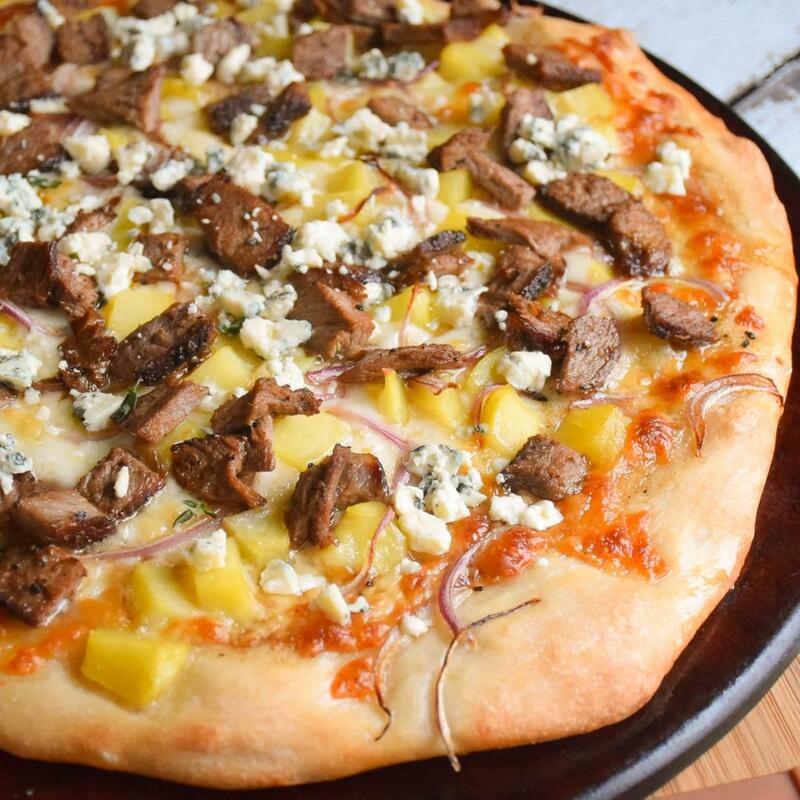 He would love to have steak and potatoes for every meal as it is, so when I made this Steak and Potato Pizza, a light bulb went off as this being another way to get what he wants! When it comes to the potato, the best way to cook it for this recipe is to boil it ahead of time. 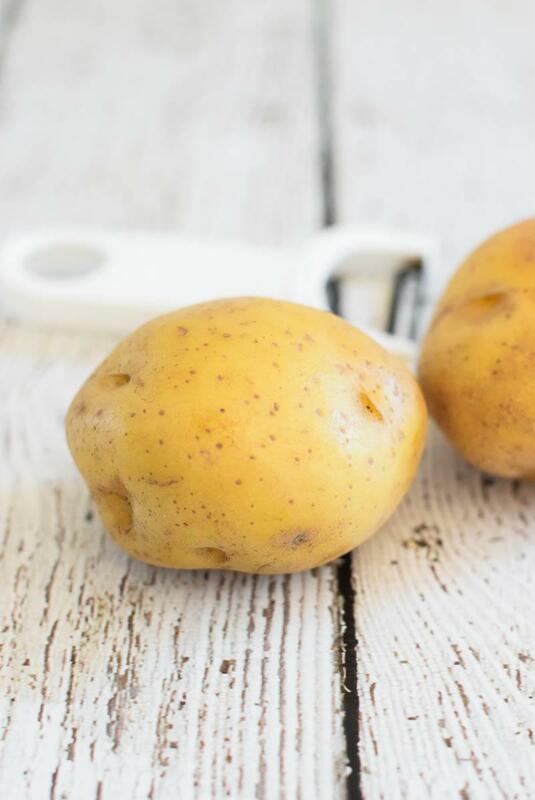 While preparing to write this post, I went over to the Idaho® Potato website to see what I could learn about the best method of cooking. Did you know that it is recommended to cook the potatoes with the skins on? 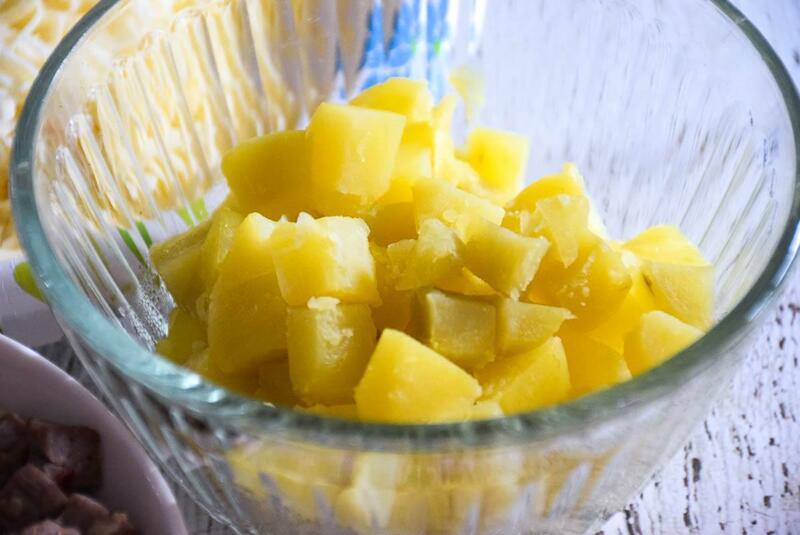 Before boiling, you just scrub the potato clean and once they are cooked, you can remove the skins if you wish. While I did boil my potatoes, I found out that the best method of cooking a potato for the most nutrients is to bake it. Speaking of baking potatoes, while I like baking them, I don’t like to wait. I like the crispy outer skin you get from baking. Did you know that you can cook potatoes in your microwave and still have them come out like you had baked them in the oven? Idaho® Potato tells you how to do it on their website! When I boiled my potatoes for this recipe I just added some salt. However, you can add some garlic cloves too if you wish to infuse even more garlic flavor into this recipe. Once the potatoes were cooked I had a hard time keeping my fingers out of the bowl and snatching up a few pieces to pop in my mouth. I absolutely love the golden Idaho® Potato and how creamy and flavorful it is! Now, about this pizza. It is so easy to have it ready to put together in no time flat for your party gathering. A pre-made pizza crust bought at the store makes life much easier (unless you must make your own, which is ok too). This is also a great way to use up any leftover lean steak you may have in the refrigerator. 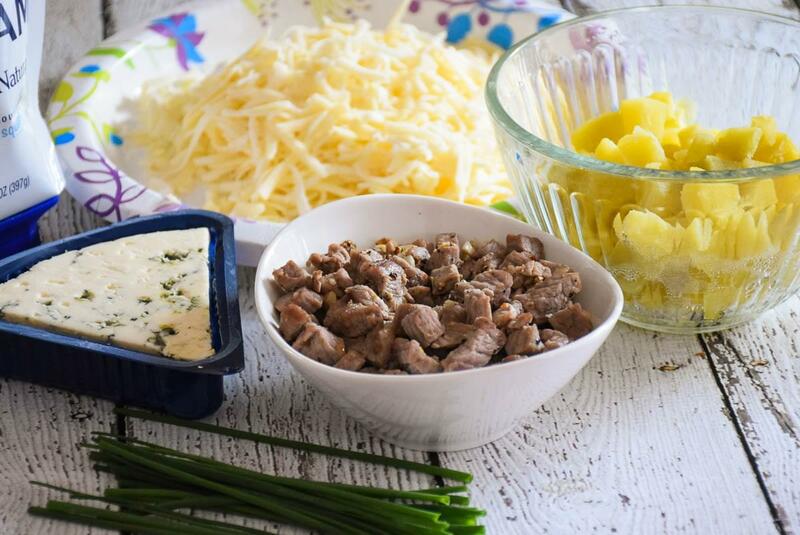 If you don’t have leftover, it is cool to buy the stir-fry steak pieces in the store and quickly cook them up with some butter and lots of garlic. You want a lot of garlic flavor in this pizza! How would you make the hearty and delicious potato the star of your easy game day recipes? The Sunday Supper Tastemakers are here to share with you all the ways they have discovered of making it the star of their recipe. Be sure to check out the links below the recipe!